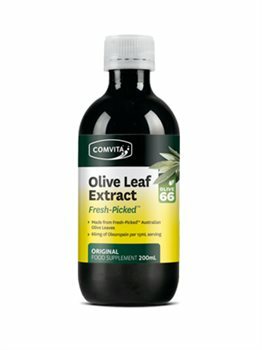 Comvita Olive Leaf Complex is a general, daily health tonic. It contains a very concentrated form of the same compounds that offer the benefits traditionally associated with the Mediterranean diet for heart health and well being. There are 30 times more health-giving antioxidants in Comvita’s fresh Olive Leaf Complex than in extra virgin olive oils and it is 400 per cent more powerful than Vitamin C. And fresh is definitely best. Scientific studies show that these compounds are more potent in olive leaf extracts made from fresh leaves than in reconstituted products. Comvita Olive Leaf Complex is an effective dietary supplement that supports the body's natural defense system against winter ailments and promotes year-round health and vitality. Made from fresh olive leaves. Vegtable Glycerin (bulking agent), Olea europaea (Olive), Leaf extract (water olive leaf solids) equivalent to 15g fresh leaf (5g of fresh leaf per 5ml dose). Contains no added alcohol or sugar. Adults Take 5ml (teaspoonful) 2 to 3 times a day with food. Take up to 15ml daily. Children over 2 years of age Take half the Adult dose. Take up to 7.5ml daily. Pregnant or Lactating women consult your health care practitioner before use.